Why Should I Get A CSCS Card And NVQ? – and it is usually by people who have been in the trade for many years and have excellent skills, but suddenly find they cannot get on sites or work for Local Authorities because they don’t have the right CSCS Card. In addition, there are also insurance companies that are requiring people to have trade qualifications when they renew their public liability insurance. The CSCS Card ( the initials stand for “Construction Skills Certification Scheme”) bears your name and photograph and on the back it has the qualifications you have attained. 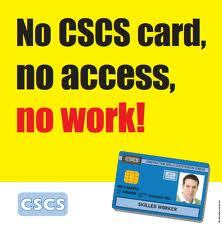 Most sites will want you to have the Blue “Skilled Worker” CSCS Card, although there are temporary, trainee and provisional cards that will enable people to get qualified whilst they are working. In addition, other cards cover Supervisors (the Gold CSCS Card), managers – even site visitors. What the CSCS Card scheme does is enable an employer or site manager to tell at a glance that the worker has passed a recognised trade qualification and also they have been assessed as understanding the basics of safety in construction. When you bear in mind just how many people get injured or killed during construction work every year, or who suffer long term injuries and disabilities to their breathing, hearing or their backs, it is not surprising that tighter regulation has been put into place and the requirement for people to have a CSCS Card has emerged. How do I get a CSCS Card? Another “frequently asked question” which we always answer in two ways – firstly “Quite simply” and then by asking “What Trade do you need the CSCS Card for?” That is how we determine which card you need. If you are starting out in construction and are going to be an Apprentice, for example, you will get a RED “Trainee” CSCS Card. As your skills progress and you complete the Apprenticeship framework and get your NVQ Level 2, you will be able to apply for the “Skilled Worker” Blue CSCS Card. If you have Three Years Experience in construction, you can go through On Site Assessment & Training to get a Level 2 NVQ, whereas people with Five Years Experience can often go through the Experienced Worker Practical Assessment Route created by CITB-Construction Skills to avoid people who do not require a lot of training to get their qualifications and CSCS Card quickly. Please Note – You need the NVQ element of the qualification, which must include assessment of your work in the workplace. Just taking a Level 2 Diploma course in a training school is NOT an NVQ and will not get you the Blue Card. It is not at all unusual for us to get called by people who have spent a lot of time and money getting a Diploma and then finding they cannot get the right CSCS Card. Always check you have been registered for an NVQ. Never assume that you can be assessed after completing the course – many places say they will do this, but have a mileage limitation on their service. We offer a one-stop shop service at SuperSkills, so you will take the CSCS Card test whilst you are with us. It is simple and there are no “trick” questions. There is an App which contains the questions and answers so you can practice. I always say to people – imagine you are on a large building site, with plant and other equipment moving around and lots of people working. Read ALL of the question, read ALL of the answers and then apply logic. The test is about Health, Safety and the Environment. It follows that you are looking for the Healthiest, the Safest or the most environmentally friendly answer. If what the worker in the question is being asked to do is unsafe, or they haven’t been trained to do it, the answer is “Don’t do it”. You have plenty of time. Most people will take about half the forty five minutes allocated. There is no set “Pass Mark” since the test changed in 2012. The system is looking at your knowledge of the subject. Get every answer right except three questions on signs – you will fail. That’s because you don’t know enough about signs. However, the three things that make most people fail (provided they have revised for the test) are Rushing, not Reading the questions and answers properly and (I regret to say) not Telling us they may have a problem with reading, so may need to use the Headphones. The basic cost of the test is £17.50. At SuperSkills, we arrange test sessions individually and charge £50.00 which includes training you by taking mock tests so you have a better chance of passing on the live testing system. You need to add the card fee, which is an additional £30.00 sent off with the application form. This type of service is also available elsewhere, but we do not charge for tests taken with the NVQ Assessment. We hope that helps you understand how the testing system works. To get a test arranged, or to get your NVQ and skilled worker CSCS Card, you can call SuperSkills on 01845 527445.